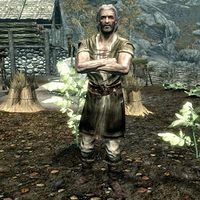 Jofthor is a Nord farmer living in Ivarstead, where he owns Fellstar Farm with his wife Boti and daughter Fastred. He is rather overprotective of his daughter who wishes to become an adventurer. He can sometimes be overheard berating her for expressing these wishes, and gives you the advice: "If you ever settle down to have kids, think twice." When speaking to his wife, he admits to her that he is handling their daughter a bit hard and is simply afraid that he'll lose his only daughter. Jofthor forbids Fastred from eloping with Bassianus Axius, believing that her lovestruck attitude will pass. 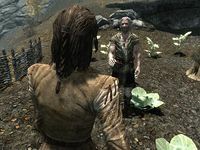 In addition, with Ivarstead's youth mostly gone in search of better opportunities, he is very reluctant to let her go. He wears a set of farm clothes and a pair of boots. 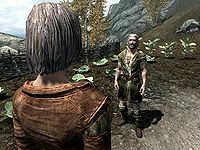 He is equipped with a leveled dagger which can be up to elven quality, and carries a key to the farmhouse, as well as a selection of common loot and gold. This page was last modified on 14 February 2015, at 10:25.